I hope all of you have enjoyed a wonderful Holiday season and your New Year is off to a great start. I know I’ve been away for a while, but as many of you may know recently (December 17th) I lost my Grandmother, Mayme. 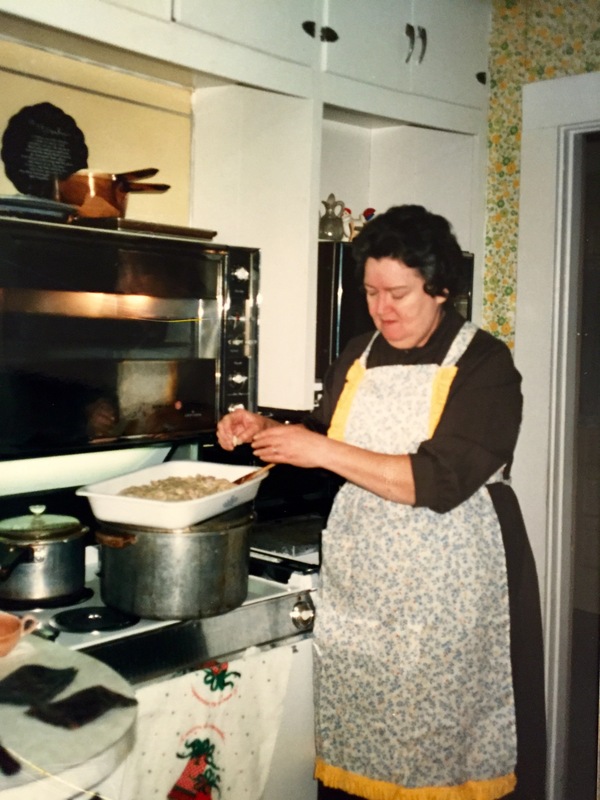 My Mayme was an inspiration to me in many ways especially in the kitchen. I have so many childhood memories of the times we shared in kitchen cooking, canning, and baking the days away. Several years ago she asked me what I wanted for Christmas and I told her I would love to have a book filled with her favorite and most used recipes written in her handwriting. 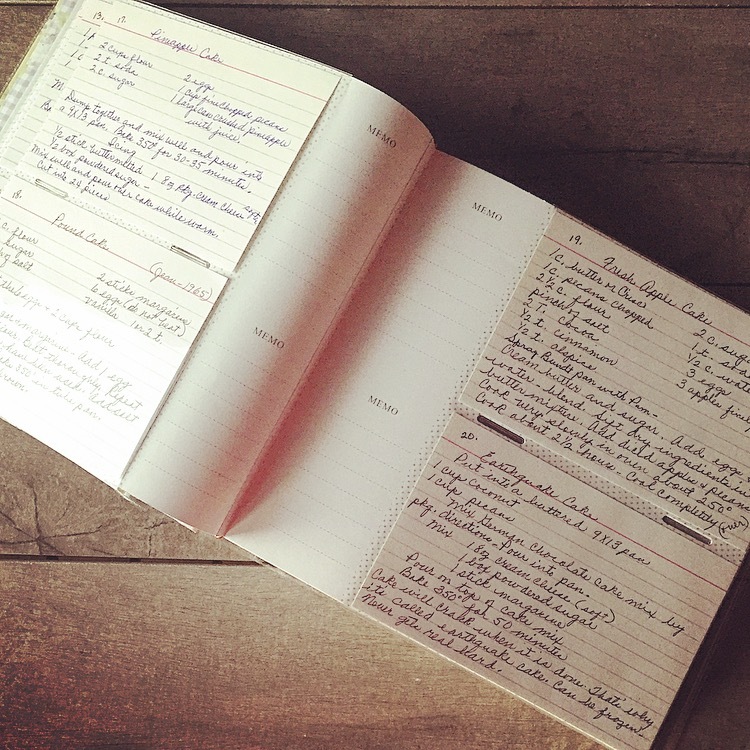 That year my sister and I each received a book filled with over 80 index cards of her recipes all in her handwriting. That book is now one of my most prized possessions. It’s been very hard over the last few weeks and I’ve missed her greatly, but I’ve found some comfort looking through the pages of her recipes and remembering all the wonderful times we shared. In honor of my Mayme I would like to share some of those recipes and memories with all of you over this next year. 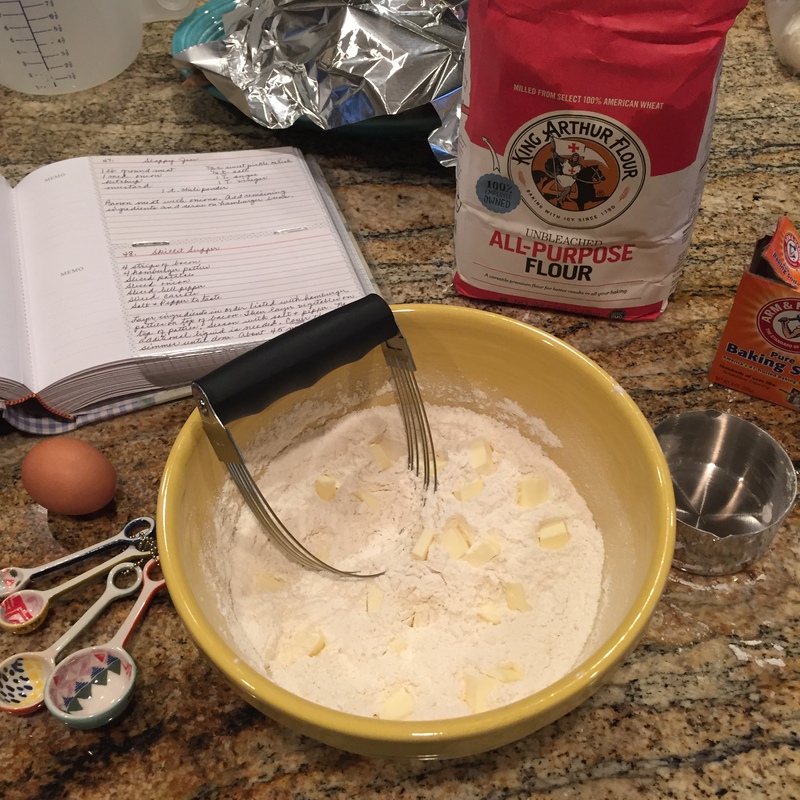 One recipe in particular has been on my mind recently and that was Mayme’s Chicken and Dumplings. 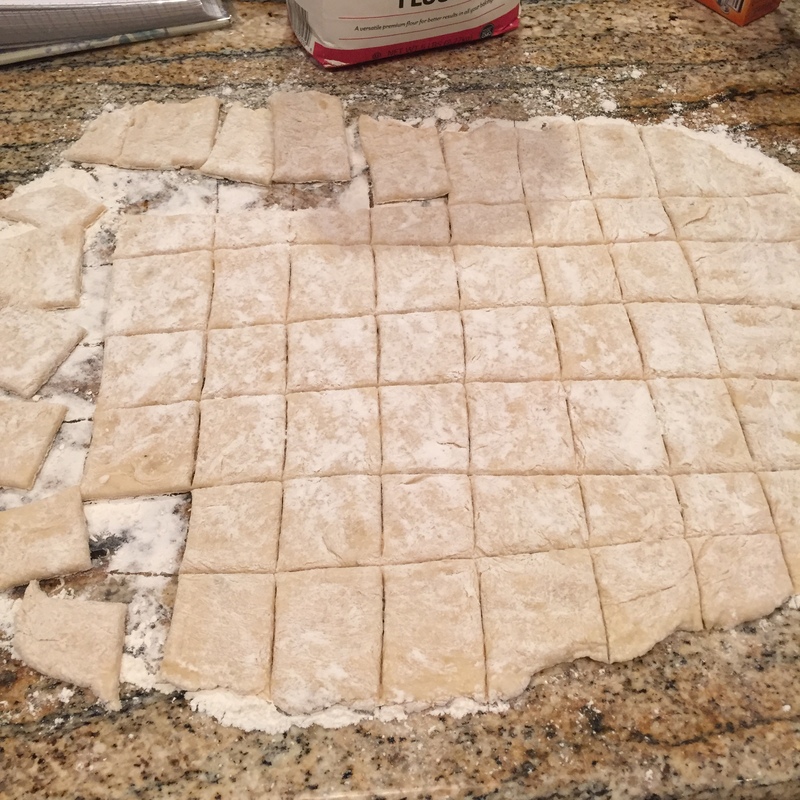 This Chicken and Dumplings recipe was one my Great Grandmother Maude Long (my Papa’s Mother) made for many years and it was passed down to my Mayme in 1971 from my Great Aunt Bonnie. These dumplings were light, tender, and they would always warm you up on even the coldest of December days (or January days for that matter). 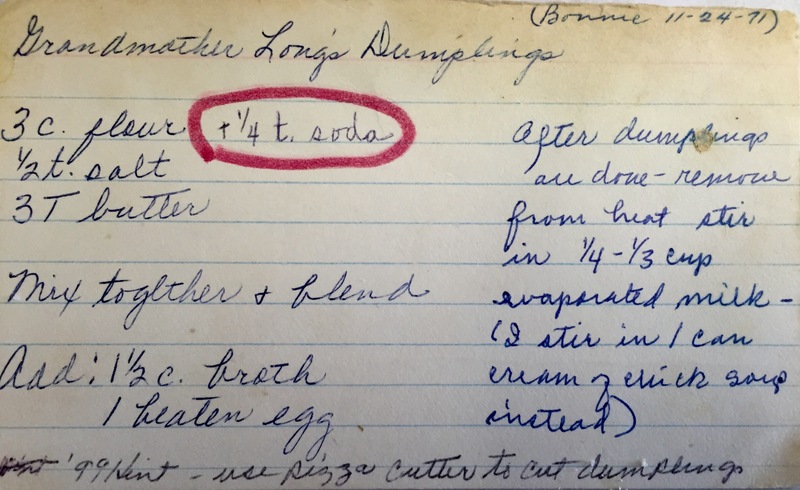 Here is the original recipe card from Great Aunt Bonnie…. 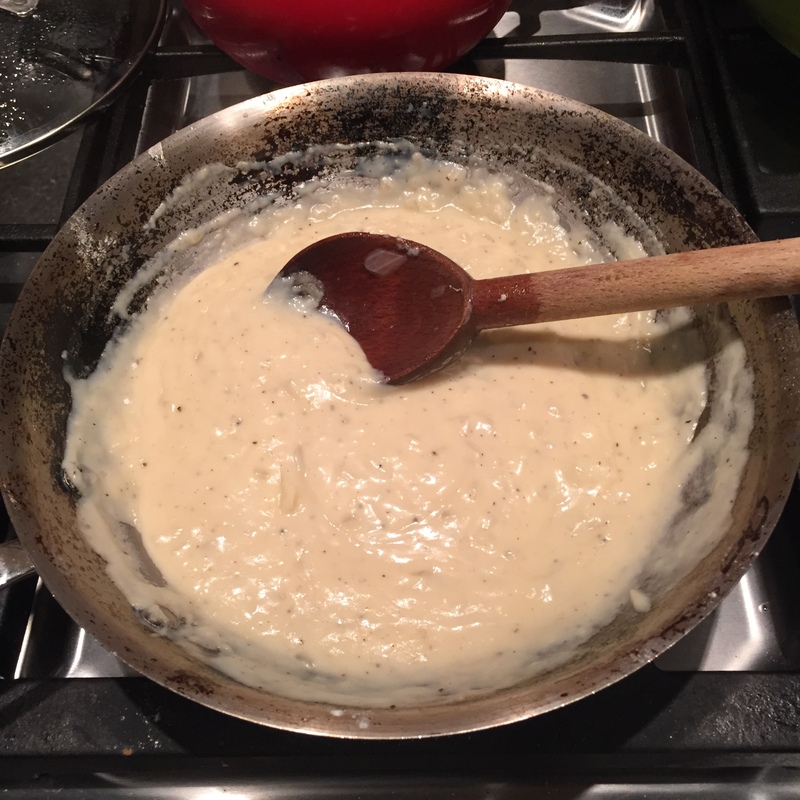 * The original copy of the recipe given to my Mayme in 1971 says that Grandmother Long added 1/4 – 1/3 cup of evaporated milk (as that’s probably what they had on hand back in the 30’s and 40’s) to the chicken and dumplings after the dumplings had cooked. My Mayme instead used 1 can cream of chicken soup. I typically don’t use canned condensed soups anymore instead I make my own condensed cream of chicken soup. Also Mayme made a note on the original recipe card that the dumplings are easier to cut with a pizza cutter. I always love seeing how recipes can change and evolve from one generation to another. 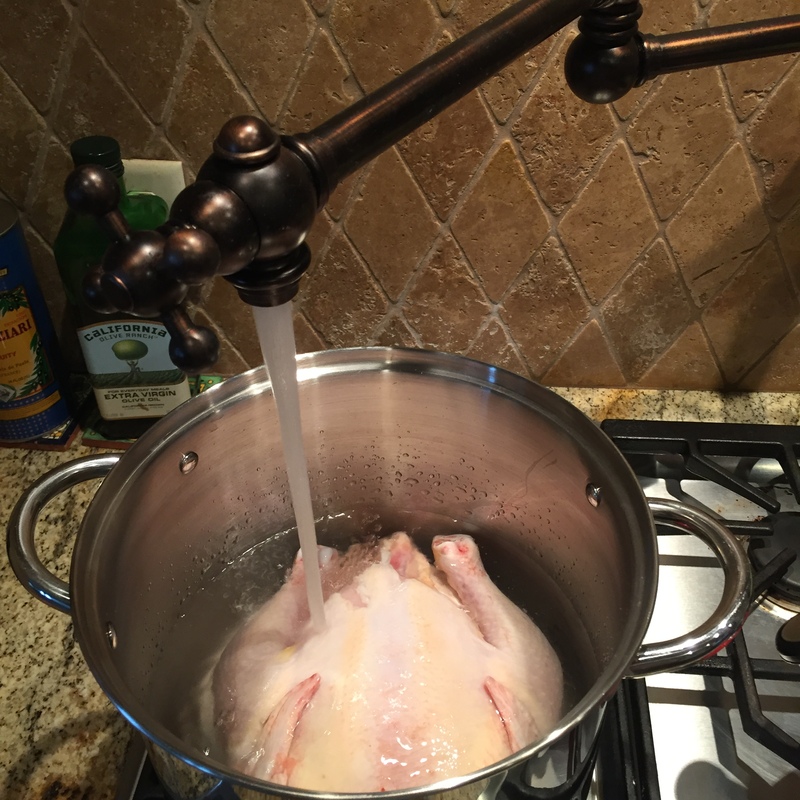 and cover with just enough cold water to cover the chicken by about an inch. 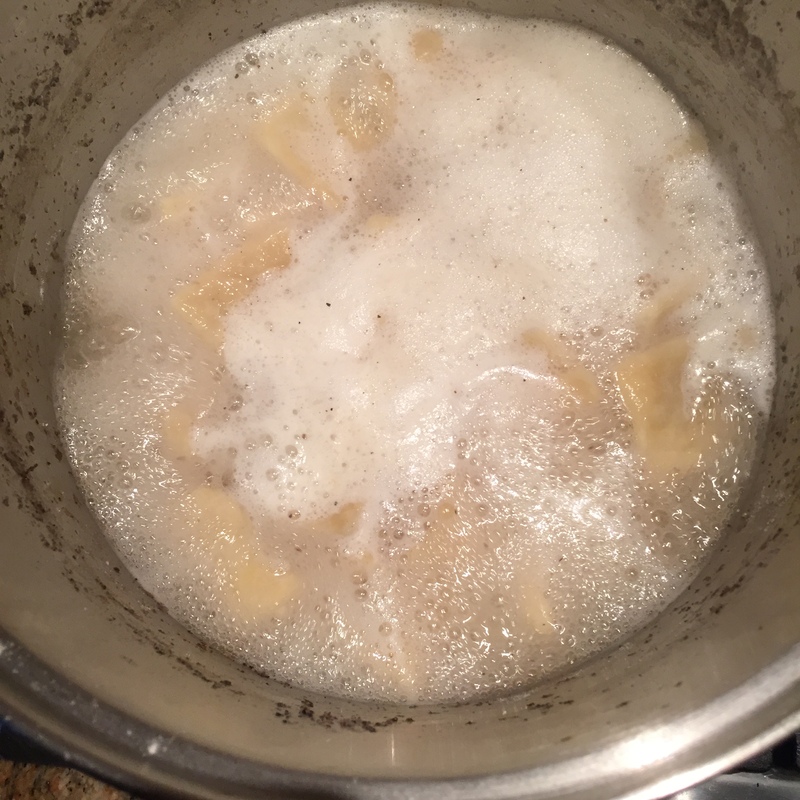 Season the water with a little salt and black pepper then bring the water to a boil. Cook until the meat begins to pull away from the bones, about 45 minutes to 1 hour. 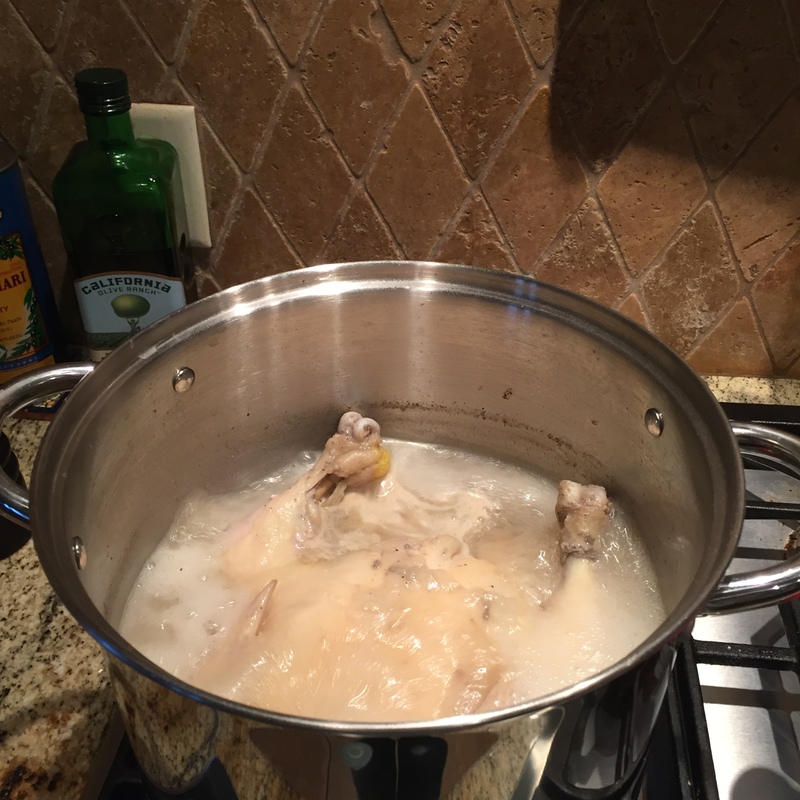 Then remove the chicken and set aside to cool while making the dumplings. In a large bowl blend together the four, baking soda, and salt. Then cut in 3 tablespoons of cold butter. Add in 1-1/2 Cups of the hot chicken broth and 1 beaten egg and mix together to form the dough. The dough will be very soft (and sticky). 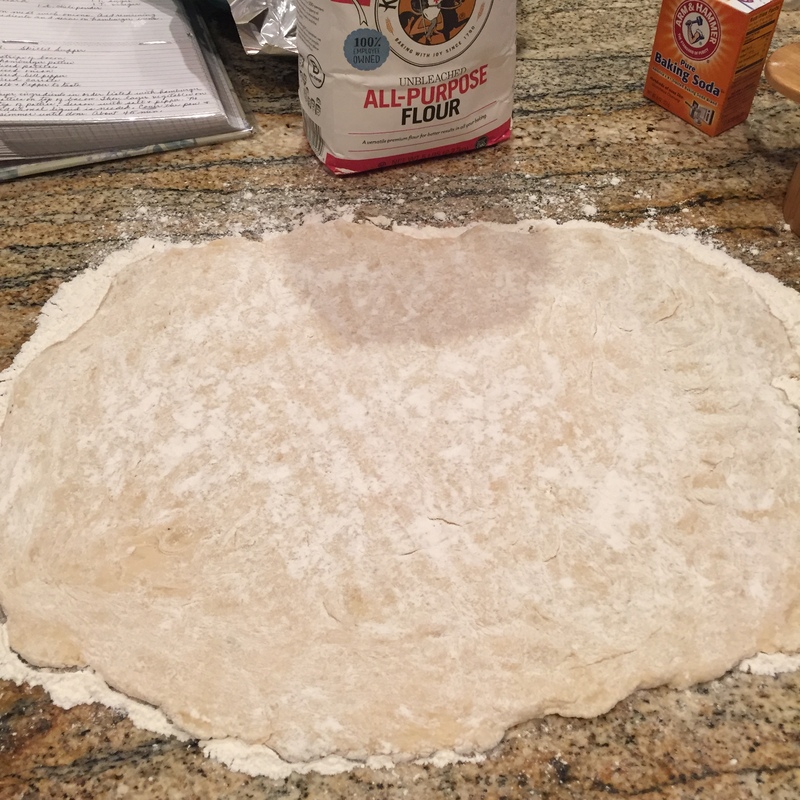 Pour the dough onto a well floured board rolling in the flour until you can pat it into a rectangle. 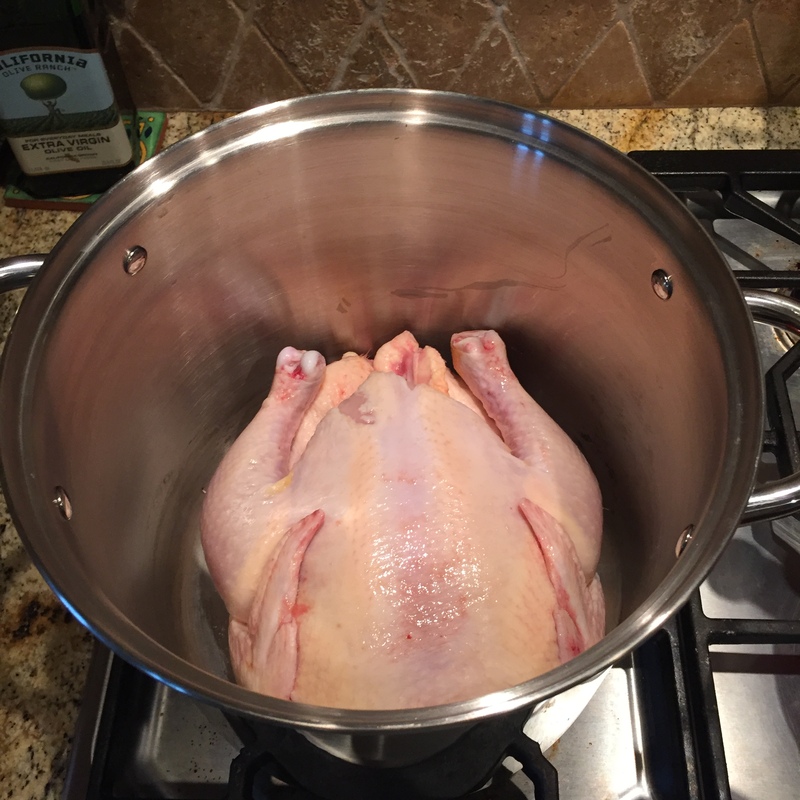 and drop into the boiling broth. Reduce heat and cover the pan. Cook the dumpling for 20-30 minutes. Meanwhile shred the chicken from the bone. Once the dumplings are done remove from heat and stir in the shredded chicken along with the evaporated milk or the cream of chicken soup. Taste for seasoning adding black pepper and salt as needed. In a medium sized skillet melt the butter. 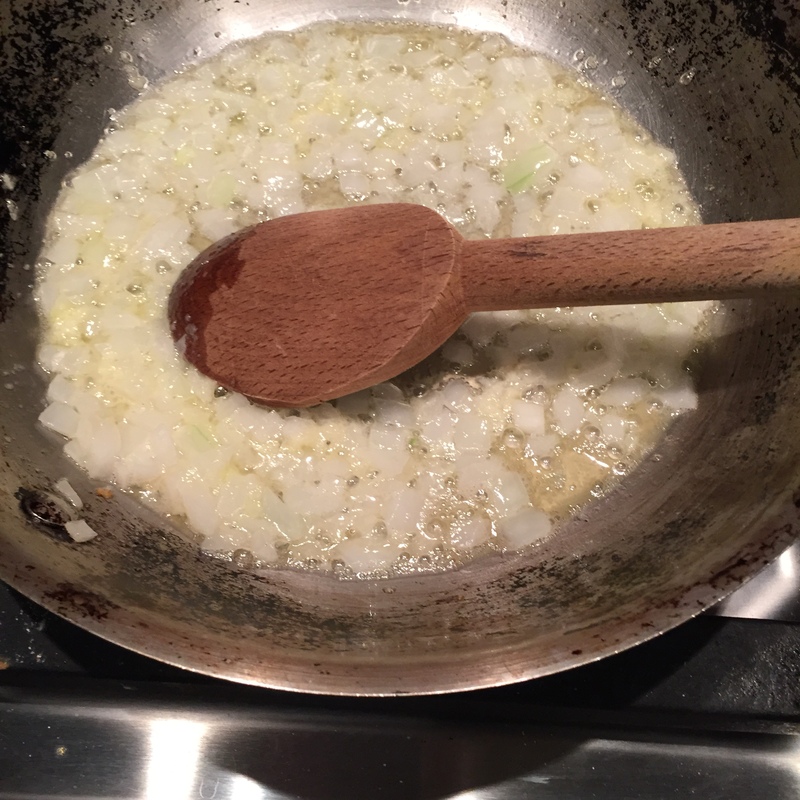 Over medium low heat sauté the onion in the butter until tender about 5 minutes. Add in the garlic and cook for one more minute. 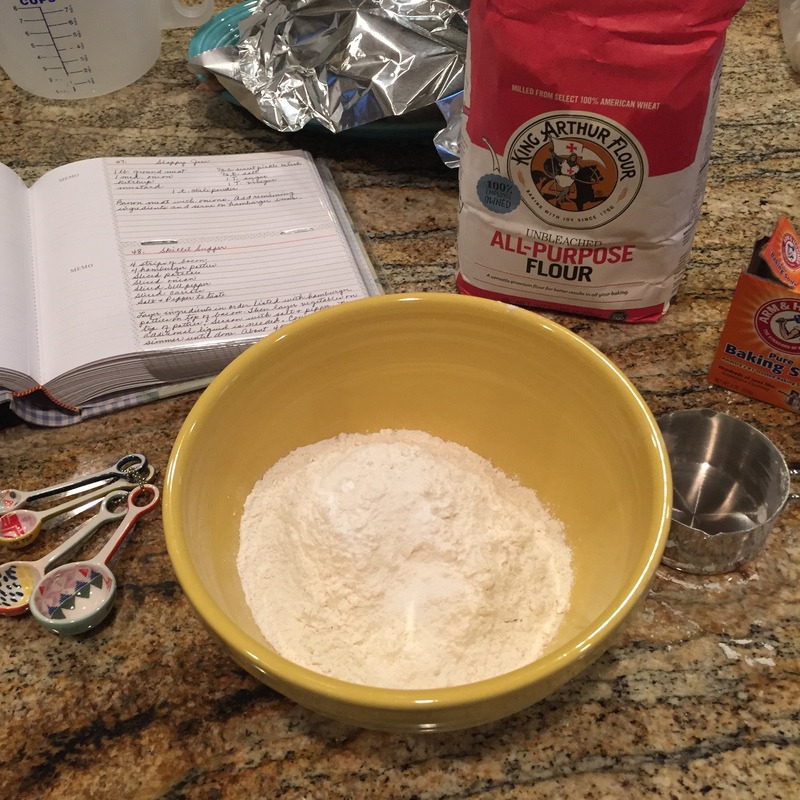 Reduce heat to low and stir in the flour and cook for about one minute. and cook until very thick over medium low heat, about 4-5 minutes. Season with salt and pepper to taste. Use as you would 1 can of condensed soup. Condolences for the loss of your grandmother. What a wonderful gift she continues to given to you and your family. And thank you for sharing with us. I’ve never made Chicken & Dumplings before so I’m eager to try this one. I hope you get the chance to make them they really are the perfect meal this time of year. What a lovely gift for you to hold during this time. Thank you for sharing your recipes and memories of her. Chicken and dumplings really is hard to beat on a cold day. In a world where everything is digital having something handwritten (in handwriting no less) really is special. Also I’ve been meaning to thank you for the lovely card you sent, that really meant a lot. Thank 🙂 That book and those recipe are priceless to me. Really sorry about the loss..Take care…I think you would have made your Mayme proud with this dish! It looks gorgeous! I am so happy to see you blogging again, you have been missed. 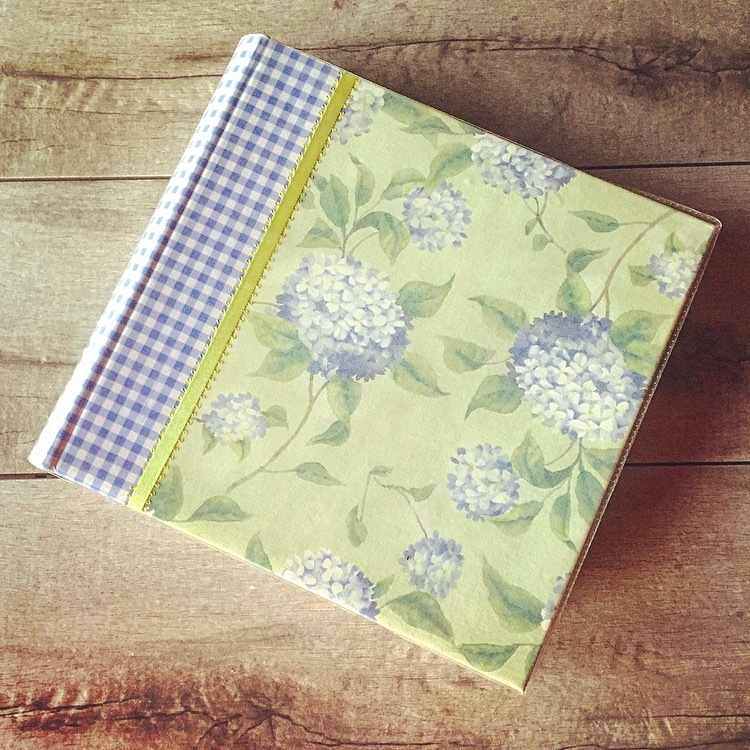 What an incredible present to have that homemade book of Mayme’s recipes! I have been making homemade “cream of” soups for years. I can’t even remember the last time I used the canned stuff, although if I were in a dire pinch I probably would. The dumplings look absolutely delicious! I’ve been craving some lately, I should probably make these soon. Happy New Year Mel! 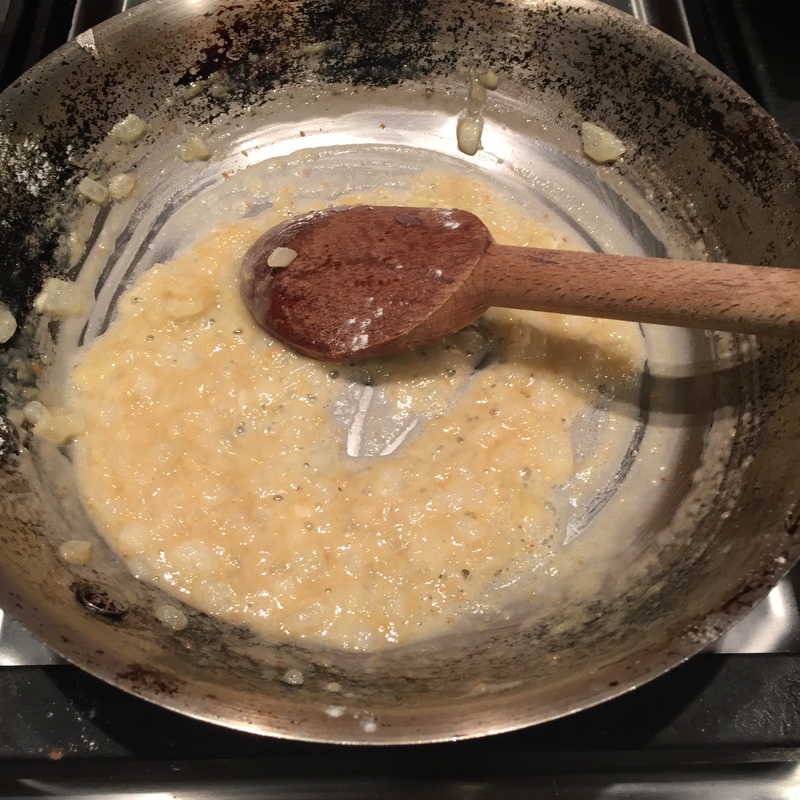 I’m glad to be back blogging (and cooking) again. I totally agree that homemade condensed soups are the best. 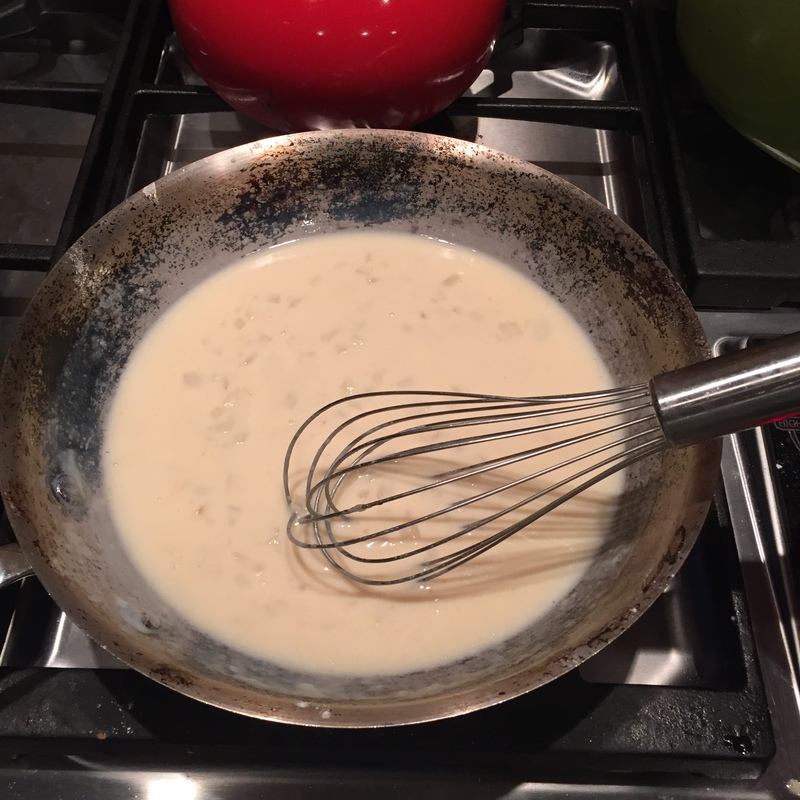 Funny story… When I told my Mayme that I had started making my own cream of soups she thought I was crazy!! She didn’t understand why I was taking a “easy” recipe like Chicken and Rice (made with 3 cans of condensed soup) and making it more complicated. She would then ask me if I ever made simple food? I would alway reply that beans and cornbread is one of my favorites and it doesn’t get more simple than that. Wow this is lovely lovely lovely. What a tribute! I sometimes wish our loved ones could stay with us forever, but today let’s focus on how happy I am that you shared this recipe. What a lovely post! I’m glad you enjoyed the recipe and the post 🙂 I like to think food is away to keep those we’ve lost alive in our memories. So sorry for your loss! What a great way to honor and remember your grandmother. Mine also shared a box of handwritten recipes and while she’s still with us, it’s certainly a blessing to have such a nice reminder of her cooking even though we don’t live close. This also looks delicious! This looks wonderful Mel– and don’t you love cooking recipes from people that are dear to you. Larry’s grandma was from Arkansas and she made some great chicken and dumplings– and her biscuits are legendary in our family! I agree! Food is the best way to bring back memories in just one bite. 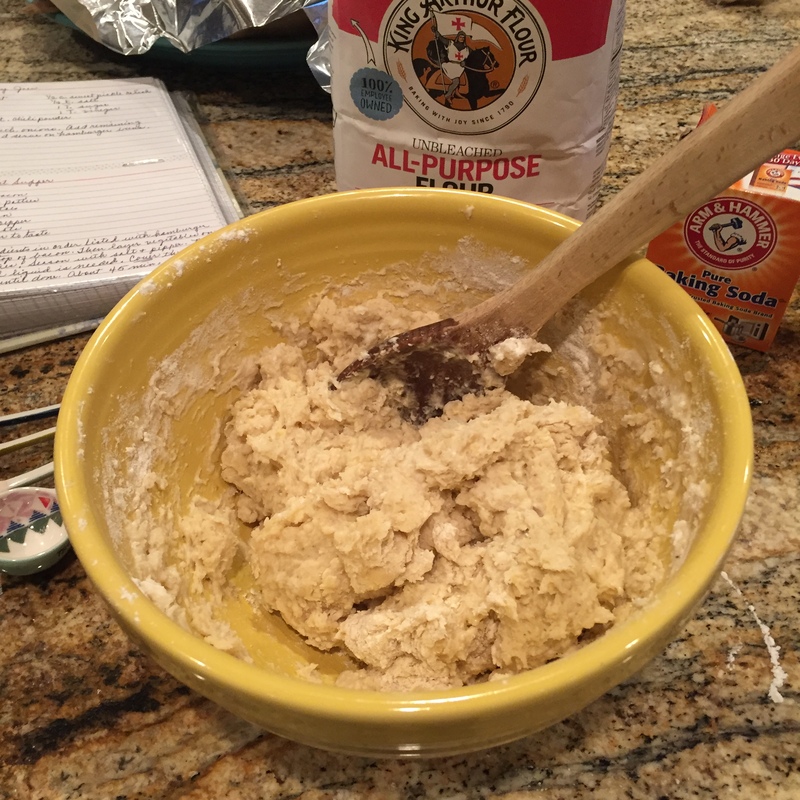 This old family recipe for chicken and dumplings actually came from Arkansas too.